After our experiment with cotton bud pointillism we decided this week we’d explore how to use oil pastels. The children had never used oil pastels before so the first thing they noticed was how the texture of the crayons was different to wax crayons: ‘thick’ and ‘smooth’. With a whole box of colours to try a rainbow was a good place to start. I suggested they could try rubbing the colours using their fingers – messy fun! 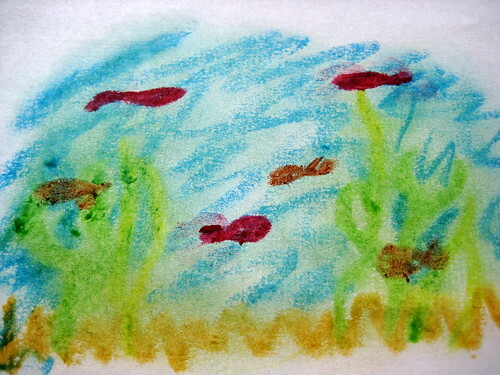 They thought this made the colours ‘blurry’ – good for under the sea pictures. I gave them the idea that they could blend the colours and they spent some time seeing what combinations they could put together. With these suggestions for techniques to try they kept experimenting to see what patterns they could make. And as they were interested in looking at Seurat’s pictures last time, I showed them Kandinsky’s Farbstudie Quadrate – and we had a try at our own version. We used small pieces of paper so everyone could do lots of different versions and see which colour combinations they liked the best. The texture of the oil pastels worked perfectly for this design as the colours blended together so well. Our own Colour Study is now looking beautiful hanging in the window with some sunshine streaming through. I love oil pastels and I love the way the kids explored ways to use them. So much more fun than regular old crayons. Their pictures are beautiful. We visited an art museum this week and I almost chose to take oil pastels with us. I opted to bring watercolor crayons instead. I love your pictures and will have to get out the pastels soon. These turned out so beautiful, Cathy! I am always surprised at how different crayons produce different results. Besides oil and wax crayons, we recently tried soft pastels and they are uniquely different. Beautiful! Kandinsky is one of our favorites. 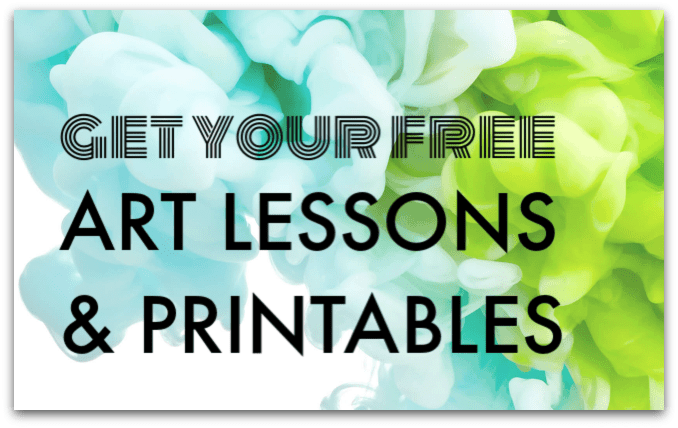 Thanks for linking up and sharing on the Smart Summer Challenge! 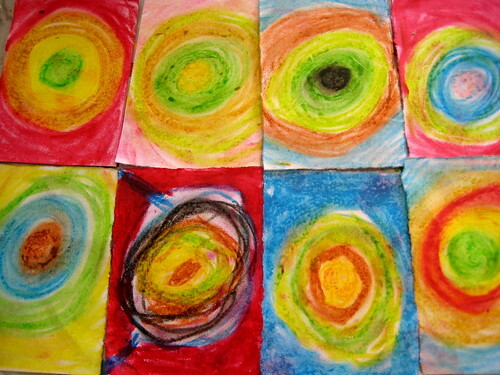 How fun to work with oil pastels, I love the circle pictures!! I will have to see if I can find my box of oil pastels!! we used oil and chalk pastels both about a year an a half ago (just after my daughter turned 3) and blogged about it here. it’s about time to bust them out again soon, i think! similar to the texture of oil pastels, my daughter also likes blending with creamy crayons. We love oil pastels! We made a lot of trees, drawing individual leaves and then blending them together. Sometimes Fall colors, sometimes green. Brilliant manner of combining the process with the Art History/Appreciation!!! Love the finished fun. There’s nothing like that smooth glide for the first time ever, or a brand new set. Slick. I get tingly right now thinking of my first go!! I’m excited, as I’ve just received a national INDIE Award of Excellence for my picture book where I am both author & illustrator, as well as the writer of the song. Love to have you pop by later this week, as I will attempt to host my first ever linkie party to give away signed books, in time for their use for the 10th anniversary observation of 9-11. Thanks for allowing me a moment to share my project, with your people. What I like about oil painting is how the light colour are beautiful on a dark sheet of colour paper. Oooh what wonderfully bright colours! I do have a set of pastels somewhere… will wait for Pip Squeak to be at a older and then have a go too! Fabulous!!! gorgeous! 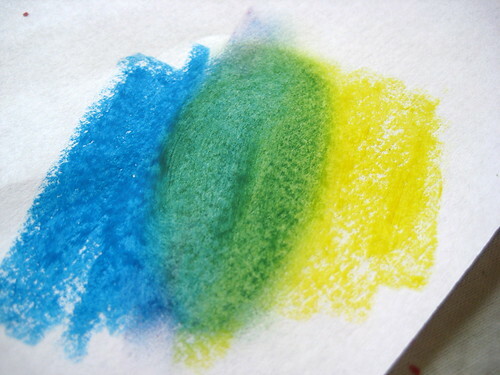 i think this is definitely the push we need to break out some oil pastels! thanks so much for sharing on Craft Schooling Sunday! what fabulously bright artwork. 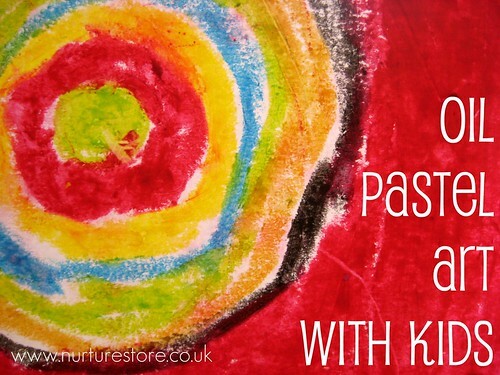 I have not used oil pastels yet with my girls – this definitely gives me incentive to get out there & try it! 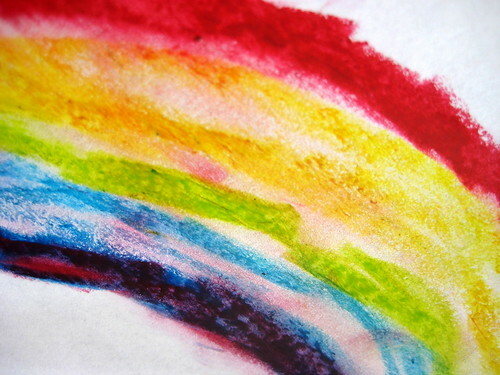 Use oil pastels as you would crayons, drawing thickly and covering paper, and then wash over the drawing with a thin layer of liquid watercolors or thinned tempera paints. 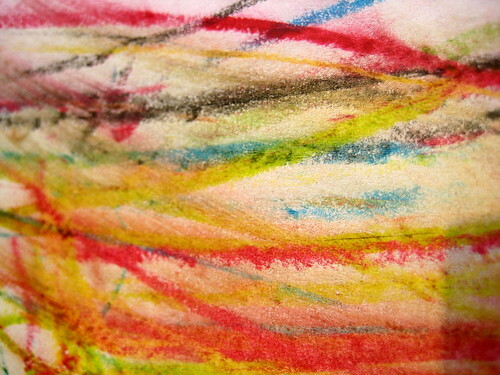 You get a beautiful crayon resist, or should i say oil pastel resist. 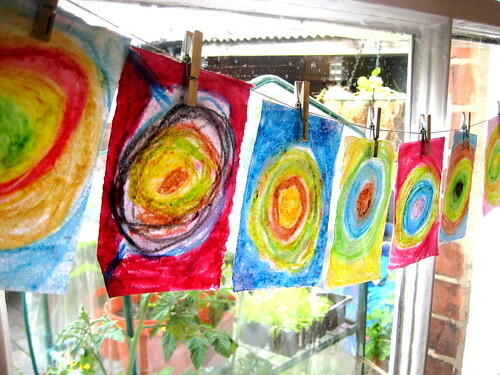 Thank you for the idea MaryAnn – we have tried that with wax crayons and waterpaint but not with oil pastels. And yes, I would love to see a picture – you could e-mail it or post it on my Facebookpage perhaps. Oh, great idea! We will have to try this sometime! I could upload a picture of a typical oil pastel resist…if I knew how to upload to your site. I’ll email you the picture. I always loved using pastels when I was a kid. I think they were my favourite medium. How wonderful that your little people are using them! They produced some beautiful works of art! Lovely! We’re exploring art materials through art journaling together and I’ve not even contemplated oil pastels. Love how bright the pictures are! So fun. Ohhh, so beautiful!!! My daughter and I love drawing together with pastels.